Since the release of his first book "Pot-Limit Omaha Poker: The Big Play Strategy" and subsequent contributions to Cardplayer magazine, Jeff Hwang has become a leading authority on Pot Limit Omaha. While his first book laid a good solid strategy for new players to the game, it was criticized for not being relevant to modern 6-max games. 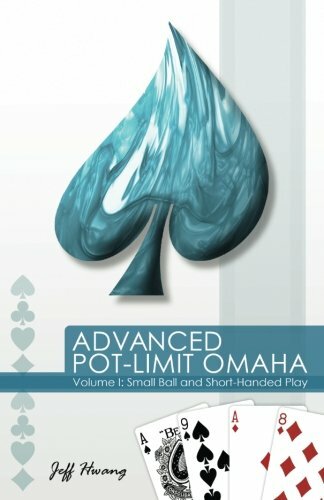 In "Advanced Pot-Limit Omaha: Small Ball and Short-Handed Play (Volume 1)" Hwang aims address those concerns, as he starts a three-volume series looking at short-handed PLO play. The first book of the "Advanced Pot-Limit Omaha" series introduces key concepts of short-handed play and looks at gaining an advantage by keeping the pots small in these competitive games. Hwang starts by introducing floating, and the different scenarios where it is useful. In the second section he goes into Advanced Concepts, including stack-to-pot ratios and position, before looking at Advanced Skills in part three which examines different raise, call and bluffing opportunities. Pre-flop three betting is covered later, as well as bankroll thoughts and miscellaneous topics which includes dealing with poor players and straddles. As you would expect "Advanced Pot-Limit Omaha: Small Ball and Short-Handed Play" goes into a lot more detail than Hwang's previous book, which only covered the basics. However, the author continues to communicate his thoughts in a clear manner, making these more complicated ideas equally as easy to understand. The use of hand examples and charts are frequent throughout, which help frame Hwang’s ideas and show how they apply both mathematically and in play. While the book offers a lot of advice, it veers away from providing a blueprint, opting instead to provide you with the various considerations you will need to make your decisions. For anyone with an interest in playing the aggressive short-hand Pot Limit Omaha games, this book will help you raise your game and compete on a higher level. It is a great start to the three-part series and a huge leap forward from Hwang's first book, with regards to depth of information. Even experienced players may find nuggets of information presented in a way which helps them think about the game differently. While PLO is a rapidly evolving game, if you are looking to for one place to find a lot of solid PLO advice then "Advanced Pot-Limit Omaha: Small Ball and Short-Handed Play" is definitely recommended.